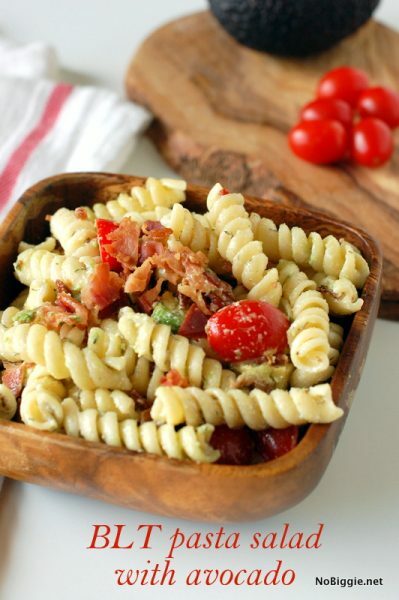 The flavors you love in a BLT sandwich, served up in a pasta salad! 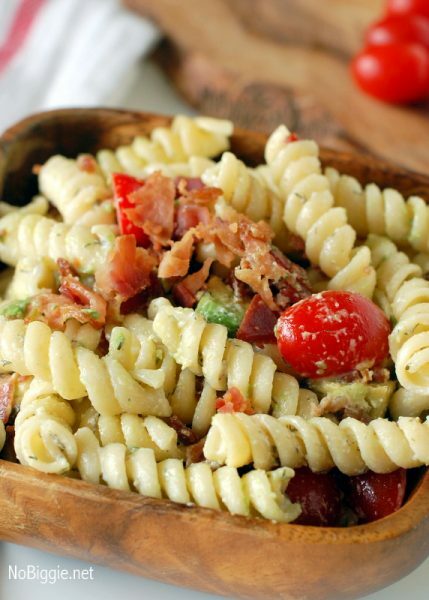 If you are a big fan of a good BLT, you have to try this pasta salad! When I first tried this salad, I was in BLT heaven. Let’s be honest the best part of a BLT is the “B”, followed by a juicy garden fresh “T” and lastly the “L”. Technically there is no L (lettuce) in this pasta salad, instead, there is an A…A for avocado. Even better, don’t you think?! We just substitute one green for another. Although I use “BLT” in the recipe title, because it’s the best way to describe how this salad tastes. 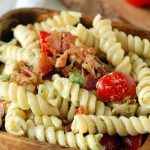 BLT Avocado Pasta Salad loaded with the flavors you know and love of a good BLT sandwich, plus avocado. Make the dressing - combine all ingredients and pour over the cooked, drained and warm al dente rotini pasta. Toss the pasta in the dressing and store in the fridge over night. Right before serving (the next day), add the crumbled bacon, diced avocado and tomato halves to the pasta and toss all together. If possible avoid chilling the whole salad with the tomatoes in the fridge, the fridge will kill the flavor of the tomatoes. That’s it! It’s the perfect salad to bring to a Summer BBQ. I’ve craved it ever since I had it!! !